Rustem Mustafayev is a musician, who plays the violin, was born in 1981 in Baku the capital of Azerbaijan. According to Rustem ever since he started to speak he was interested in music and sound. He would associate sounds he hears with tunes and that was also around the time where he was interested in music. When he was 5 years old he saw someone playing the violin, that was the day where he wanted to play the violin and also when his passion started. He started his first grade in “Bülbül Music School” in Baku. At first, his parents brought him there hoping that he would give up half way through... However, he was passionate about music and thanks to that passion the teachers saw he had potential. His teachers told his parents that he is very gifted and they they should let him go after his passion for music. While he was at the Bülbül Music School he entered many competitions and performed music plays for his school. He was a great student who won competitions and managed to impress a notable audience with his skills with the violin. For this reason, at 8th grade Rustem went to Turkey and started to continue his education in Bilkent University. Ever since Rustem has been a musician who works as a professionally around the world. How does a musician get evaluated? Rustem thinks the same precodure is the same for schools or orchestras. To see if any musicians are qualified, first they test out their musical skills. Once they pass the test, it shows they are good enough and they are accepted to a school. This also goes with the many groups that Rustem has worked with. "Someone wants to bring together a group of skilled musicians so they send out and invite people to participate in their group." Rustem says. And after a musician is invited, he or she is still tested out on their skills to see how good they are. Rustem has also done solo concerts. He said that while he does not get scared, he still is nervous before starting hie solo concerts. “It’s kind of normal now for me, you’re always thinking 'what if I mess and embarrass myself?' to yourself but thankfully I have always managed to be successful in solo concerts.” he says. 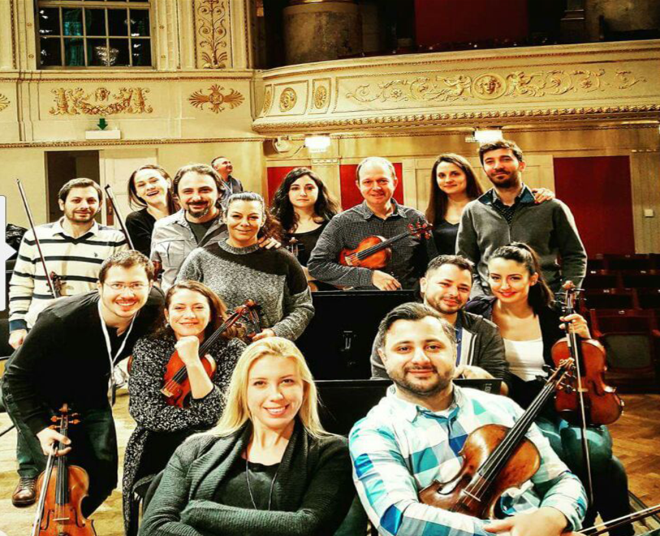 During his career, Rustem has gone to many festivals with Borusan Orchestra. Those include a BBC festival held in London, he went on a tour with the group in Germany and Austria, recently went on Hong Kong for an important tour and is planning on going to ​ South America in the near future. Rustem has a message to those who want to be musicians. "It’s not just about skill, it’s also about one’s passion about music." he has. "If one makes music but doesn’t have the slightest passion for it, then it is possible they will not very far with his or her career." It was the passion that started his career as a musicians and that he is proud and happy that he chose to go after his passion and follow his dreams.